Jessica Lavariega Monforti, the new dean of the College of Arts and Sciences, speaks at Opening Convocation in August. When her book on the DACA program came out in 2014, Lavariega Monforti was teaching at the University of Texas–Pan American a few minutes from the Mexican border. The tale begins with children who grow up in America and call it home. They’re not trying to fit in. When you grow up here, you already fit in. Frequently, they’re not prepared for a shock that comes in high school: that they lack a social security number. This bad news often breaks when it’s time to get a driver’s license or apply for college. No one had told them they were born in another country and still could be forcibly sent away to it. When political scientist Jessica Lava-riega Monforti, the newly hired dean of the College of Arts and Sciences, and two co-authors published Living the DREAM: New Immigration Policies and the Lives of Undocumented Latino Youth in 2014, some of their readers were surprised to learn about the strong sense of belonging felt by so-called Dreamers. A majority of the 101 young people in four states who were interviewed for the book had at one time simply assumed they were U.S. citizens. What’s more, the sense of American identity sticks with these young people after they learn about their legal status. The book came out two years after the Obama administration created the Deferred Action for Childhood Arrivals (DACA) program, which allowed some qualified undocumented immigrants who arrived as children to remain in the country, essentially in exchange for registering with the government. The administrative program served as a temporary substitute for a legislative solution such as the Dream Act, which was never passed by Congress. In September of this year, the Trump administration announced the end of DACA and informed Congress that it had until March 2018 to do something about the status of nearly 800,000 young people who risk deportation. 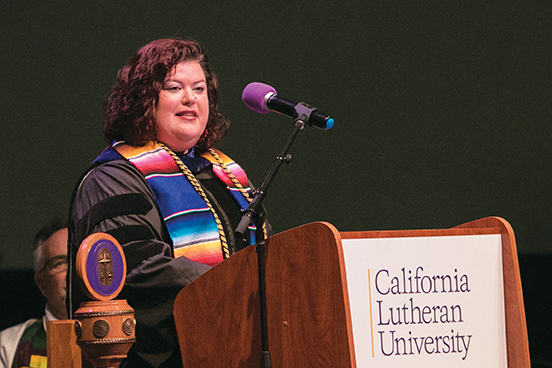 At Cal Lutheran, a few dozen undergraduate and graduate students are – for now, while DACA winds down – still permitted to work and study under the program. It’s a sizable group, right at one percent of all of our enrolled Kingsmen and Regals. At this alumni magazine, we’ve elected so far not to contact DACA recipients from the student body to avoid drawing additional attention to individuals. Nor have we internally requested data that might identify them. However, based on government numbers and the gleanings of Lavariega Monforti and her colleagues, we can say quite a bit about them. In the observations below, we assume that Cal Lutheran’s DACA-protected students are no different from others enrolled at universities around the country and especially in Southern California, the region with the largest number by far of approved applicants. On average, they arrived at age 6. Many have U.S. citizen family members, such as a sibling born in California. About a third speak only English. For the two-thirds who are bilingual, English typically is the dominant language. They probably have never been back to their countries of origin. Compared with undocumented students, young U.S. citizens with family members in Mexico make more trips where they can pick up the language and culture. Nearly all of their families settled within driving distance of Cal Lutheran, and most of them now commute. Given DACA’s requirements, they’ve all stayed in school, were honorably discharged from any military service, have never committed serious crimes, passed a background check, and paid fees for initial and renewal applications. In many cases they hold multiple jobs and do “heroic levels of work” to support family members financially, Lavariega Monforti says. They major in all academic disciplines, but are sometimes drawn to teaching, pre-law and business with a focus on entrepreneurship. A high proportion will pursue graduate school, sometimes earning multiple advanced degrees, partly because of impediments to building careers. “Because there is an attempt on their part to really prove that they belong, they do over and above what the average student is doing in terms of community service and community engagement, and are active in their churches,” according to the new dean. Some have challenges heaped on them. Nationally, one in four DACA participants is a parent. In some cases, their own parents or other family members have been deported, and they could be taking on the responsibility of parenting siblings. Their undocumented status haunts them. Sometimes they must “come out” as noncitizens to friends and romantic partners. They are especially unlikely to report sexual harassment and abuses by employers. Someone has threatened to call immigration on them or a family member. Anyone inclined to lend a voice to their cause, Kimball noted, will find resources online for advocacy, including from the Hispanic Association of Colleges and Universities and the Evangelical Lutheran Church in America.